A current release of an old Japanese kit. Sadly I can't show you the original artwork which was much nicer. I love all the Lindberg boxes. The very first kit I bought was a Lindberg Messerschmit 262 plane, acquired during a day trip to Switzerland whilst at summer camp. I must have been 10 years old at the time. What a kit, what great artwork!! This one is in the same league, designed to make little boys dream. Not sure which version this box is. Very nice kit, you can still buy the MRRC version, although I doubt if the artwork is as nice now. 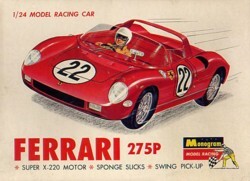 Later type Monogram box for the 1/24th version of their 275P, not as nice as the early boxes. 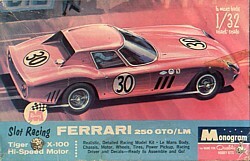 Another Revell original kit, re-released about 5 years ago with the same artwork. The 1955 version of the Mercury. Some of these kits were later released by the UK factory, I think the difference is that the date did not appear on the box.